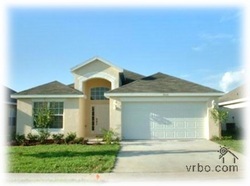 This villa is recently built in 2005. 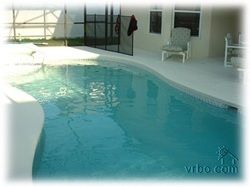 You will benefit from a superb villa with all modern appliances finished to the highest specification. Along with a family sized swimming pool with jacuzzi spa Just a stones throw from the major attractions of Disney, Universal and Sea World lies our wonderful family a large pool deck which provides some shaded dining area well furnished with loungers and comfy seating and dining table. The gated community of Mission Park offers security and is just minutes away from the new development area of Cagan's Crossing offering a wide variety of shops and restaurants very close by. Whether you like to golf, shop till you drop or visit the parks we are in the ideal location. 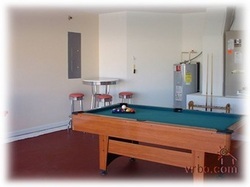 Our garage offers a full games room with pool table. Our fully fitted kitchen which is open plan opens into an informal dining nook with a serve over counter ideal for informal lunches and breakfasts all crockery and utensils are supplied. 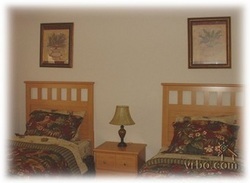 The laundry facilities are hidden away in a large closet just off the main kitchen area. 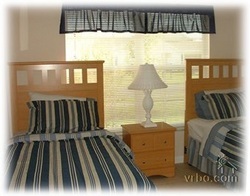 All bed linen and towels are supplied. Our formal dining room seats 8. The family room opens out through patio doors onto the deck and pool area two comfy sofas and casual seating and high quality furniture. 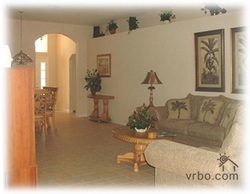 Entertainment is provided by cable TV, DVD player or just relaxing to music. 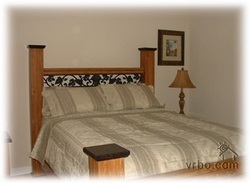 Our Master bedroom has a king size bed cable TV, large walk-in closet and an ensuite bathroom. Master bedroom 2 has a king bed and ensuite bathroom, tv and is furnished to a high standard, the twin rooms have 2 twin beds in each room. The Mission Park community provides a community pool and a children's playground a short walk away.